Wrought iron is best known for being used in outdoor applications like security screens, gates, fences and balustrades. But wrought iron can be shaped into any number of different accessories for your home. Let us open your eyes to the possibilities of exquisite wrought iron accessories! Wrought iron is a malleable yet sturdy material. It can be shaped to create beautiful designs, adding elegance and interest to your interiors. Wrought iron was used for furniture in the middle ages and it has been sought after time and again because of its classic look and versatility. The most exciting thing about using wrought iron in a modern home is that no two wrought iron pieces are exactly the same. From custom twists to decorative insets, symbols and symmetrical styles, each wrought iron accessory is unique and can be personalised based on your design preferences. When teamed with other home décor, wrought iron can elevate a room’s feel, giving the impression of luxury and elegance. On the other hand, it can be just as useful as part of a country or seaside chic interior design. Wrought iron accessories not only add interest to a home, they can actually raise its value. The experts at Dean Wilson Iron create bespoke iron masterpieces, tailor-made to suit the aesthetic of your home. Here are some stunning ways wrought iron can accessorise your living spaces. If you want a bespoke piece of furniture that will stand the test of time and hold its own against the outdoor elements, you must consider wrought iron furniture. Whether it’s an outdoor table setting, an indoor occasional table or even a bed head, wrought iron furniture can add the wow factor to any area of your home. Wrought iron furniture can look as elegant or rustic as you like. Detailed designs draw the eye and command attention, whilst more subtle lines create a classic base for your neutral or vintage accessories. and pretty much any home accessory you can think of! A bed frame is a stunning way to display wrought iron, from ornate filigree bed heads to simple, sturdy frames that will last you a lifetime. 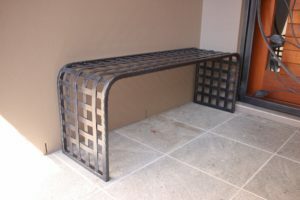 Wrought iron benches can provide additional seating, indoors or outdoors, or be used as a feature to display homewares in the hallway. A side table can be a feature piece, set alone on a blank wall. Or create a nest of tables to set the scene for your overall décor plan. Wrought iron outdoor furniture can withstand harsh climates, unlike timber or aluminium. It won’t rust or rot and requires little maintenance or upkeep. Wrought iron furniture is great value for money if you are after pieces that are durable and will stand the test of time. It can also be dressed up beautifully for dinner parties or an afternoon high tea. Wrought iron is also popular for use in garden features, like archways, privacy screens or water features. A wrought iron sculpture is sure to be a talking point tucked into your garden landscape! The durability and texture of iron makes it an ideal material for use outdoors. A wrought iron sculpture can be a valuable addition to your home – both aesthetically and in terms of investing in one-off work of art. Archways and privacy screens are the most popular applications of wrought iron in the garden, however, especially when combined with a beautiful flowering vine or topiary pots. Iron archways make a stunning entry way to your garden, ideal for a relaxed wedding or family celebration amongst the trees. If you can’t find a door or gate latch that suits the style of your property, a custom made wrought iron latch can be designed and created. A custom-made latch can turn a simple door into a prominent feature of your home. Wrought iron can be shaped into an opening screen on the door as well, allowing visibility without compromising on security. If you have an open hallway or an inset space that needs filling to give it character, wrought iron is the perfect solution. A vine-like or baroque inspired design can instantly fill the space to create an artistic feature in your home. A feature pillar can also be installed in the outdoor area to add extra support and draw the eye beyond the patio. Despite the fact that wrought iron is a solid, heavy material, the ornate designs to which it lends itself mean you can enhance the look of your garden with a screen, rather than block it out. Inset screens and pillars can also be tailor made to suit existing furniture pieces to create a cohesive interior. It’s a misconception to assume wrought iron accessories are only good for older style homes or homes that have a classic opulence. Wrought iron can be shaped into modern patterns, like vertical or cross panels, along with on trend concepts like chevrons. Talk to an iron design expert to create something perfectly matched to your current design trends – or pleasingly contrasting for effect. If you are interested in adding some wrought iron accessories to your home, why not call the team at Dean Wilson Iron? They have over 25 years’ experience in the industry and no job is too big, too hard or too ‘out there’ for their creative team. They welcome collaborations and enjoy the rewards of seeing a client’s dream become a reality. Thinking of adding wrought iron accessories to your home? Contact the team at Dean Wilson Iron today!